Every week we pull together some great Canadian recipes from Canadian food bloggers around the web featuring one main ingredient or dish. This week, we are all about making your life easier with 17 super creative Instant Pot Recipes! Can you believe that up till now we hadn't done an Instant Pot recipes roundup? Shame on us! From endless conversations at the office about the amazingly delicious and easy meals you can make with the gadget in just a few minutes, to the thousands of stories and reviews of it flooding the Internet, we are very much aware that the Instant Pot craze is here to stay. We've heard of people making bread with it; we've heard of people making yogurt with it; we've heard of people making giant pancakes with it. So, obviously, we needed to check if all the rumours were true and, guess what? They are! Seventeen Canadian food bloggers decided to show us some of the endless possibilities of cooking with an Instant Pot, from creamy hummus to fall-off-the-bone ribs. So, go ahead, click on the images below, drool a little and have fun making some (or all) of these yummy and quick Instant Pot dishes. 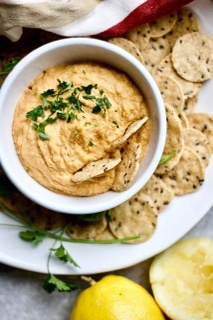 This [Sprouted Chickpea Hummus](https://yangsnourishingkitchen.com/sprouted-chickpea-sweet-potato-hummus-instant-pot/) is easy on digestion, protein-packed and nutrient dense. The added sweet potato makes the hummus so delicious, and a great recipe for the picky eaters who should be eating more vegetables. From **Yang's Nourishing Kitchen**. This [Salmon Biryani](https://joyceofcooking.com/instant-pot-salmon-biryani/) is full of flavours and so so easy, you won’t believe it! The trick is to marinate the fish and veggies ahead of time to fully get the flavours infused into this dish. From **The Joyce of Cooking**. These [Taiwanese Green Onion Beef Rolls](http://www.nomss.com/instantpot-taiwanese-green-onion-beef-rolls-recipe/) consist of a crispy, flaky, green onion pancake with a little chew. The classic snack can be enjoyed on its own or paired with some delicious tender beef shank. From **Nomss**. This [Butter Chicken](https://theprimaldesire.com/pressure-cooker-butter-chicken/) is easy, paleo-ized, delicious and, now with the Instant Pot, FAST! From **The Primal Desire**. This [Lasagna Soup](https://www.extraforavocado.com/healthier-instant-pot-lasagna-soup/) recipe is healthier than your usual one but with just as much amazing flavour and in half the time in your Instant Pot. Family Approved! From **Extra For Avocado**. This Instant Pot [Beef Roast](https://www.cathysglutenfree.com/instant-pot-beef-roast-gluten-free/) with gluten-free seasoning and gravy provides tender, moist, flavourful protein to enjoy without heating up your oven for hours. From **Cathy's Gluten Free**. This [Teriyaki Chicken](https://www.saltandlavender.com/instant-pot-teriyaki-chicken-recipe/) is fast and easy! The meat turns out super tender and the sweet sauce is a crowd-pleaser. From **Salt & Lavender**. This super easy recipe for [BBQ Ribs](https://leelalicious.com/instant-pot-ribs/) produces the most tender fall-off-the-bone texture in a lot less time than the slow cooker would. Can be made with any cut of pork ribs you prefer. From **Leelalicious**. [Smoky Lentil Sloppy Joes](https://delightfuladventures.com/lentil-sloppy-joes/) get some of their flavour from liquid smoke but also from the onions, garlic, oregano, paprika and the many other delicious ingredients it takes. A great idea for a quick lunch. From **Delightful Adventures**. The gingery broth in this [Chicken Pho](http://www.clockwatchingtart.com/2018/01/instant-pot-chicken-pho.html) is an amazing complement to the meat. The recipe is quick and easy enough for a weeknight and makes fantastic leftovers. From **Clockwatching Tart**. Click on the images below to be taken to more great Instant Pot recipes! A big thank you to all our FBC Members who participated in this weekend's Instant Pot Recipes roundup.